Need something heartfelt to give as a gift and need it now? I've got just the thing for you. Personalized Mason Jar Snow Globes! Each one costs less than $10 and the more you make the cheaper per unit it'll be. Most of the tutorials you see instruct you to glue the ornaments or trees, whatever you're putting in the globe, to the lid however, I found that when you do that, it messes with the button and edge of the lid, not allowing you to properly close the jars. 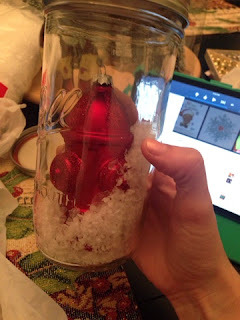 Instead, put hot glue all over the bottom of the ornament and place it into the jar. Pour in fake snow (and glitter if you'd like). Make sure you shake the fake snow around so you don't fill it too much and can't see the ornament. If you have any ornaments that need to hang from a string, put a drop of hot glue on the lid, pull the string across the drop, hold in place, and cover with another drop of glue. Let dry. 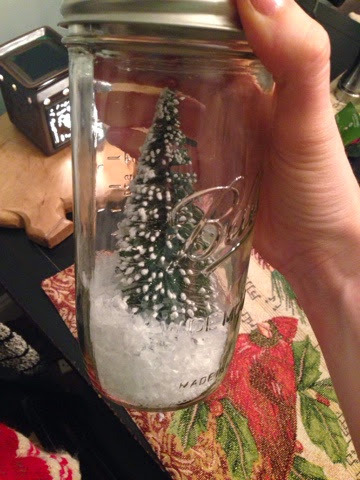 Then, pour fake snow into the jar and put the lid on, letting the ornament dangle from the lid. I had a blast making these for my in-laws based on all their different interests. Have fun!